now for the nitty gritty! I ordered the paper-source A7 cards in sage to fit in the center of the pocketfold, but beware! They were just slightly too big, and the pocketfold bubbled when I tried folding it shut. I ended up having to slice off 1/8 inch off of each of the cards! I left Christie's with a huge stack of printed paper and a heavy duty paper cutter and got to work! Christie printed thin black lines for precise cutting, and I cut inside those lines, as close as possible. It was really important for accurate cutting because of my perfectionist tendencies so they would fit properly in the pocketfold. I shared the beginning of this process here, and spent 2 nights a week plus saturdays for almost the next month cutting these, a little at a time. 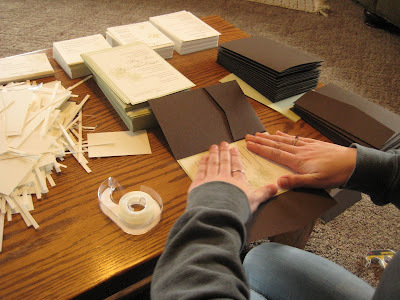 In the end, I cut 6 pieces for every invitation and then for about 25 of them, added California Reception insert. sis K1 taping the middle insert to the pocketfold. I realize this makes me look like I force all my relatives to DIY for me, but really I only took a short break for [crappy] pictures! Finally, just for one last time, the final product! The last two pictures are a little bit sad to post, because I forgot to take a photo of the set before I sent my own through the mail. You can clearly see the indents and folds from the envelope. But it still gives the idea of how it looked closed. What's your favorite thing to do on a rainy day? They turned out WONDERFUL! Great job! 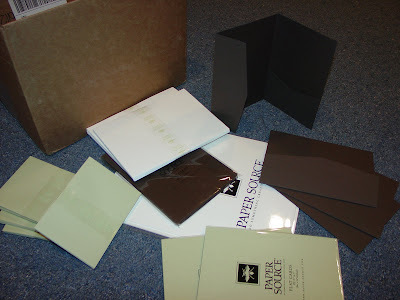 Your pile of papersource paper looks almost exactly like mine did when I unpacked it! I had khaki, superfine soft white, and chocolate brown. 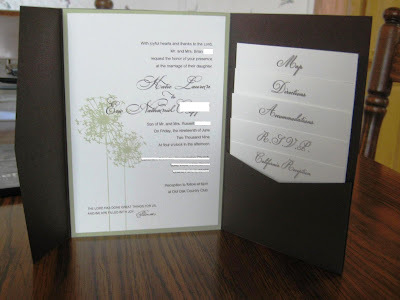 Your invites look great!